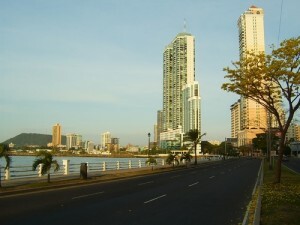 The largest upscale area within Panama City is the strip that runs some 3.5 km along the Pacific Ocean. It is where some of the city’s highest end real estate is located and where more development is slated. It is named for Vasco Núñez de Balboa who was a Spanish explorer, governor, and conquistador. Known for being one of the most costly (per kilometer) roads in the world, the avenue is a major financial district for Panama and the rest of Central America. It is home to several tall building and points of interest including: Bisca Financial Center, The Arts Tower, Rivage, YOOPanama, Torre Waters and Torre Megapolis. The skyline at night is particularly beautiful as it is illuminated with the lights from these tall buildings. Avenida Balboa intersects with Corredor Sur and sees some 75,000 vehicles per day. It was completely renovated and remodeled in 2009 and it’s expansion made it a focal point in Panama City. It features a wonderful Oceanside walking pathway along the avenue as well as several shopping villages, stores, and restaurants. People love to rent bikes and bike along the avenue’s bike lane as well. There are several street vendors as well offering great local fare. The Bay of Panama City can be seen from all along the avenue creating one of the best photographs in the area. Visit this metropolitan center of Central America.